In addition to corn hole courts and an endless supply of Red Bull, one of the hottest trends for the modern office is the use of bold and colorful environmental graphics. Environmental Graphic Design (EGD) is quickly becoming a core component for interior designers to convey the soul of an organization, not only with their color pallet, but also encapsulating their ideals and beliefs. 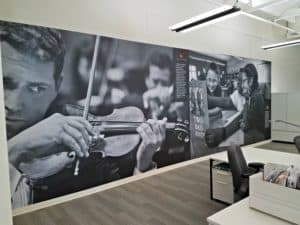 EGD can help ensure the entire team is connected to the organization’s goals and principles through a dynamic wall mural with the company values or timeline depicting key milestones. 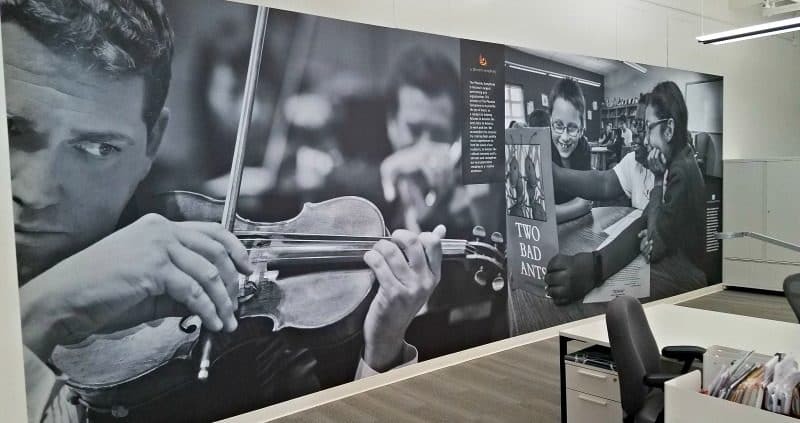 Environmental graphics are one way to make a good experience great, by introducing inspiration, meaning and purpose into the workspace, as well as brand authenticity. There’s also overwhelming evidence that shows clear links between employee well-being and organizational success. Researchers at University of Warwick found that “happy” employees are 12 percent more productive than those who are unhappy. Various pioneers of the progressive workplace gathered earlier this year to discuss how the workspace is critical to today’s most dynamic companies’ success at the “Future Offices 2018 Conference” in New York. BuzzFeed’s Julia Goldberg, VP, Global Real Estate, Facilities, Security and Studio Operations, shared how leveraged designs and technology help companies attract and retain top talent. While Tracy Hawkins, Global Head of Real Estate & Workplace at Twitter, explained how the workplace greatly influences organizational culture and can even create new behaviors. The key takeaway was the modern workplace was not simply a building but rather a critical component of their business strategy. According to Harvard Business Review, “You need to have employees who understand and embrace the distinct ways you create value for customers, the points that differentiate your brand from the competition, and the unique personality that your company uses to express itself.” So keep in mind that the interior design element can make a workspace great, but to elevate it to truly amazing you should consider environmental graphic design. 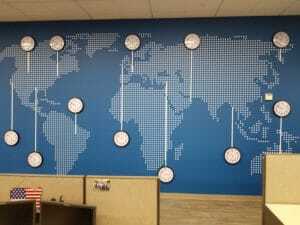 Check out some of our examples of EGD utilizing wall murals, window graphics and dimensional signage.